Prices start from just USD $519 per person! 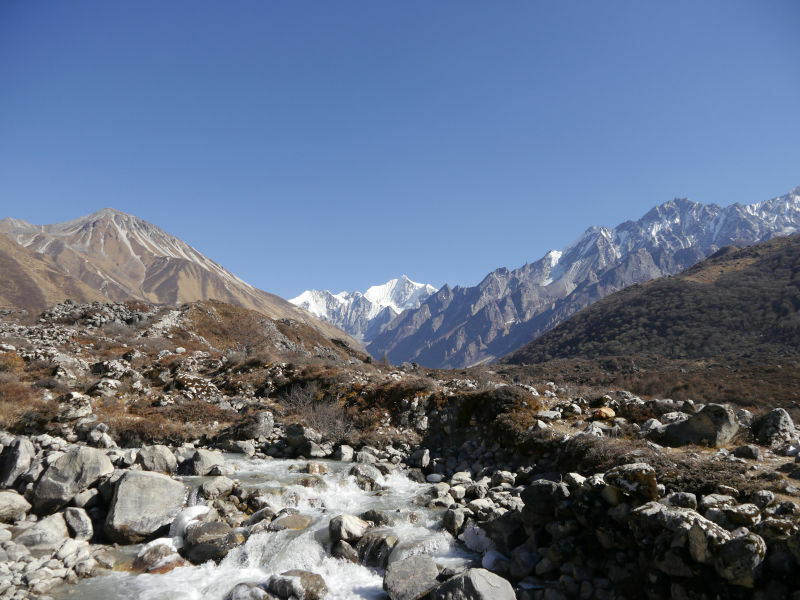 The magnificent Langtang region is perfect for those seeking nature in abundance. Like all trekking regions in Nepal, Langtang is growing more popular, yet it’s less visited than the busy Everest and Annapurna regions. 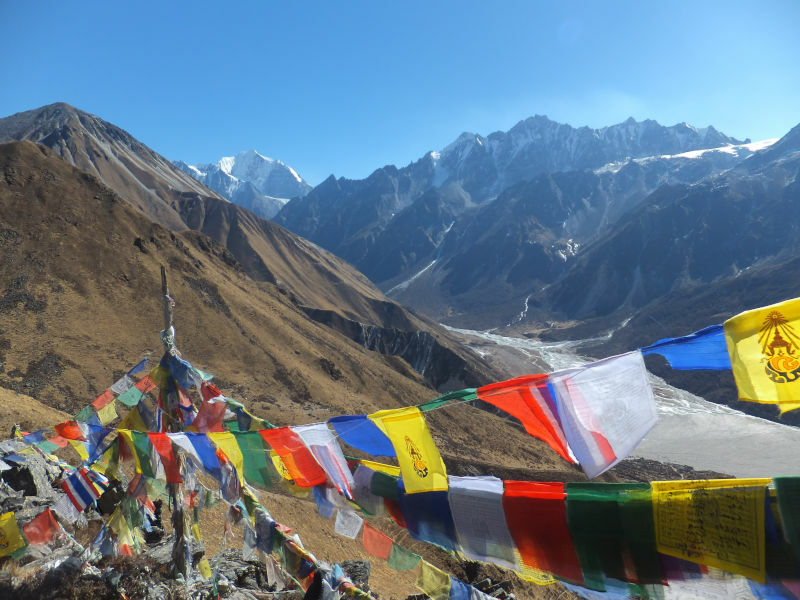 The Langtang Valley trek in Nepal ticks so many boxes! Being fairly short, it’s perfect for beginners or those with less time for trekking. Trek through forests rich with flora and fauna including masses of rhododendrons (in full bloom in Spring), and spot exotic birds and monkeys! 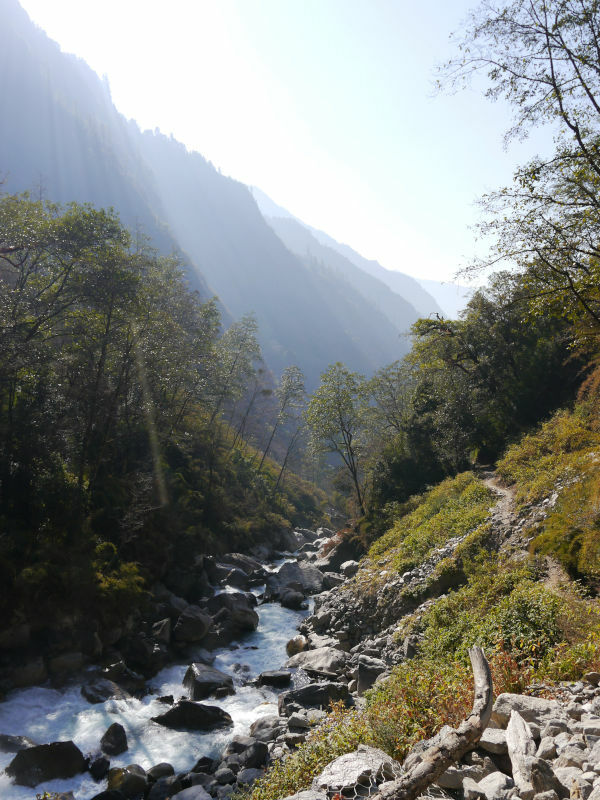 Relish the magic moment when you leave the jungle and step into the wide open space of the beautiful Langtang Valley. 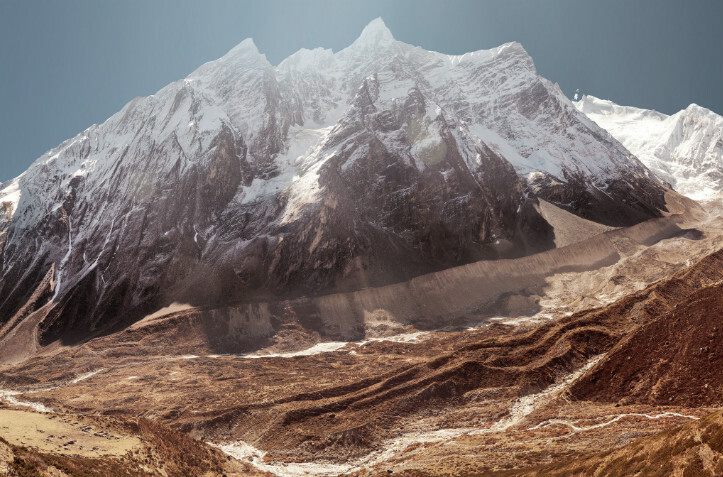 Then witness the enormity of the Himalaya when you spot Langtang Lirung (7,227m/23,711ft) for the first time! The highlight of our trek – we summit Kyanjin-Ri (4,773m/15,659ft) and enjoy one of the most spectacular 360° views! 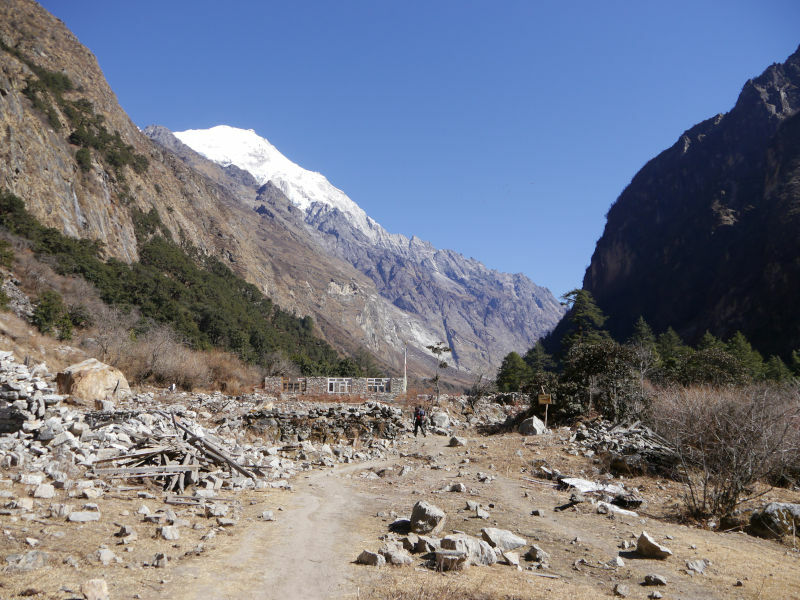 The Langtang Valley trek includes some long walking days and steep ascents. 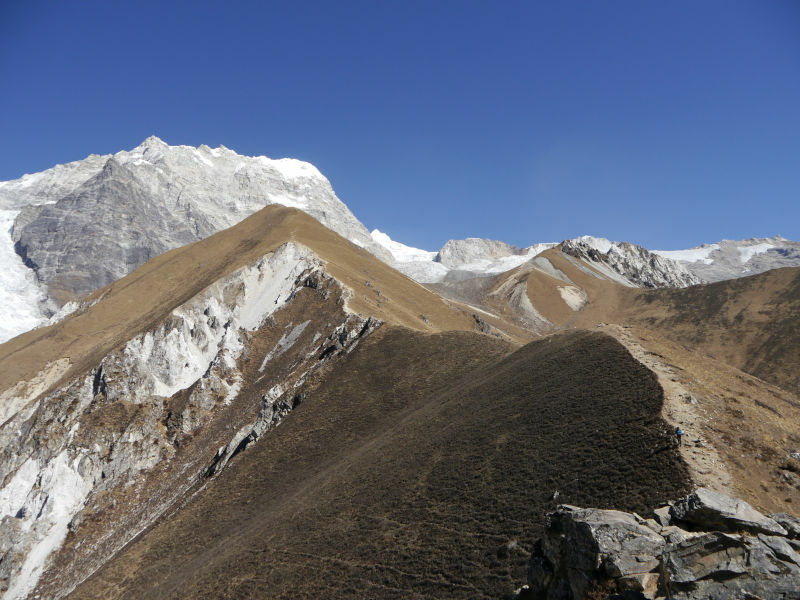 So, we recommend you have a moderate level of fitness to do this trek. 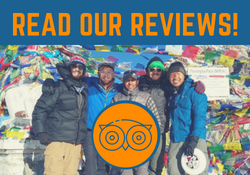 Team Nepalorama trekked in the Langtang Valley in January 2018 – read our blog to find out more about this stunning trek. Or, read our clients’ recommendation from September 2018. After an overnight stay in a comfortable 3* Kathmandu hotel, we travel to Langtang by tourist bus or private jeep. Both options take the best part of a day, with a jeep being slightly faster, safer and more comfortable. Our destination and the starting point of our trek is Syabrubesi, close to the Tibetan border. The river runs through this lovely town surrounded by steep mountains where Nepali and Tibetan people meet to do business. We start our trek following the glacial blue waters of the holy Trisuli River flowing from Gosaikunda. We ascend gradually and sometimes steeply through stunning forests of rhododendrons (in full bloom in Spring). Spot grey langur monkeys playing in the trees, exotic birds and giant beehives clinging to the mountainside. After trekking through the jungle, when you step out into the beautiful Langtang Valley, the feeling of space is magical! 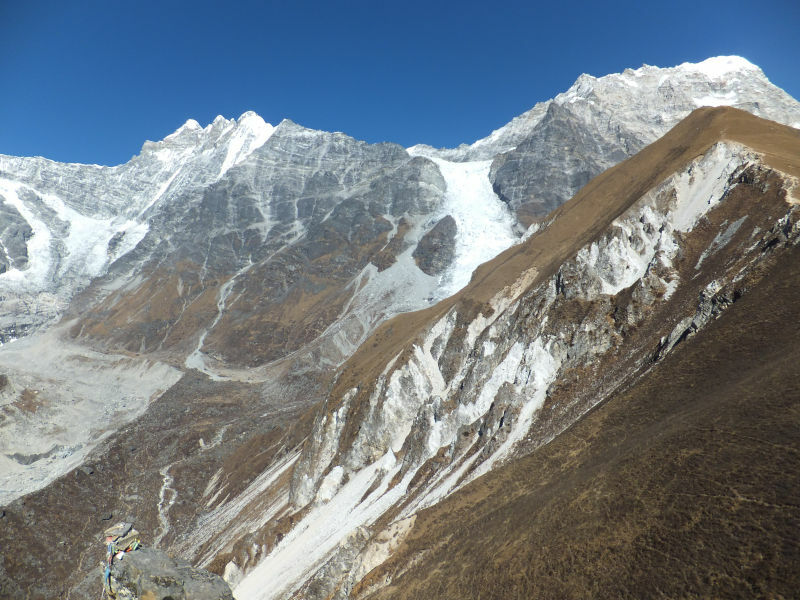 The backdrop – Langtang Lirung (7,227m/23,711ft) is our destination! After three days of good walking we reach beautiful mountain settlement Kyanjin Gumba – our base for two nights as we rest and summit Kyanjin-Ri. From Kyanjin Gumba, cast eyes on our summit – Kyanjin-Ri. We’ll climb steeply yet steadily for two to three hours watching the town of Kyanjin Gumba getting smaller and smaller. When you reach the summit, take a deep breath and feel the exhilaration as you take in the magnificent 360° view including a postcard perfect view of Langtang Lirung (7,227m/23,711ft). Colourful Tibetan prayer flags create the perfect frame for the many beautiful peaks that surround you. After a long drive back to Kathmandu, stay in Nepal a little longer and enjoy the capital. Kathmandu is home to seven UNESCO World Heritage Sites, so you’ll be sure to want to see some! Ask us about including a sightseeing tour in your itinerary and make sure you allow time to pick up souvenirs and gifts! We’ll be waiting to pick you up when you arrive at Kathmandu Tribhuvan International Airport. After a potentially long flight, you’ll be wanting to rest. So we’ll take you straight to your 3* hotel in Kathmandu. If you still need to pick up some equipment for the trek, we’ll help you find everything near your hotel in Thamel, the tourist haven of Kathmandu. We leave Kathmandu after breakfast. Choose to travel by tourist bus or private jeep. It’s a long drive to Syabrubesi (six to seven hours) and the road is very rough in places with long stretches carved out of the mountainside. Keep yours eyes peeled for an incredible view of Mount Manaslu (8,156m/26,759ft) – the eighth highest mountain in the world! Enjoy stunning views of the snow-capped giants along the Tibetan border. 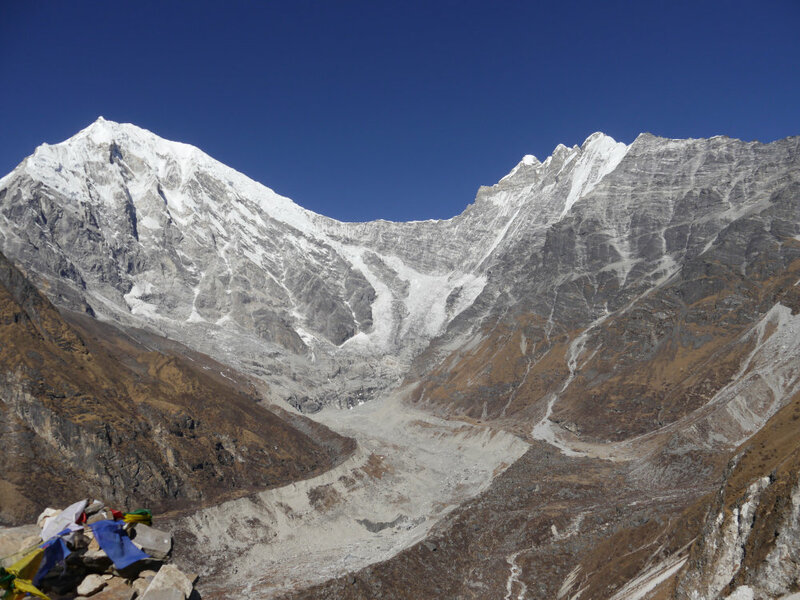 Then spot the mountain we’re going to get up close and personal with – Langtang Lirung (7,227m/23,711ft)! We leave town via a swinging suspension bridge and then walk on the new road for about 45 minutes until we find the trail. We climb up into the jungle rich with flora and fauna, following the roaring sound of the Trisuli River. The first day of any trek feels tough and this one is no exception. Test your legs immediately as we climb up, only to climb down and back up again! The trail gradually ascends, sometimes steeply, but the views will keep you distracted. Look out for grey langur monkeys playing in the trees above, majestic waterfalls, giant beehives hanging precariously, and the beautiful glacial blue fast flowing water below. Enjoy a well deserved rest in Bamboo where we eat overlooking the river. After lunch the trail climbs steeply for two hours then levels off to make reasonably easy walking for the rest of the day. Finally we reach Lama and enjoy our first glimpse of Langtang Lirung from the trail. We make our way gradually and steadily uphill through masses of rhododendrons. See stunning waterfalls and observe landslips and damage still visible from the huge earthquake in 2015. After almost a day and a half walking through jungle, it’s amazing to step out into the open valley of Langtang! We continue on the flat through the valley before climbing steeply for about 30 minutes. We stop for lunch in Thyangsyapu and enjoy incredible views. After lunch we climb again for about 30 minutes before the valley opens up once again. Then it’s easy on our legs, but perhaps heavier on our hearts as we observe the devastation from the earthquake. We cross the enormous avalanche site and as we reach the ‘new’ Langtang village, we’ll see the memorial for the 243 people who lost their lives in 2015. The recent rebuild of Langtang means that teahouses are more modern and luxurious here. There’ll be plenty of time to explore as this is our resting place for the night. Today is an easier day with time to rest. We leave Langtang and continue easily to Mundu past several shrines, and then on to Kyanjin Gumba. The size of this mountain settlement in the middle of nowhere will amaze you, not to mention the views! 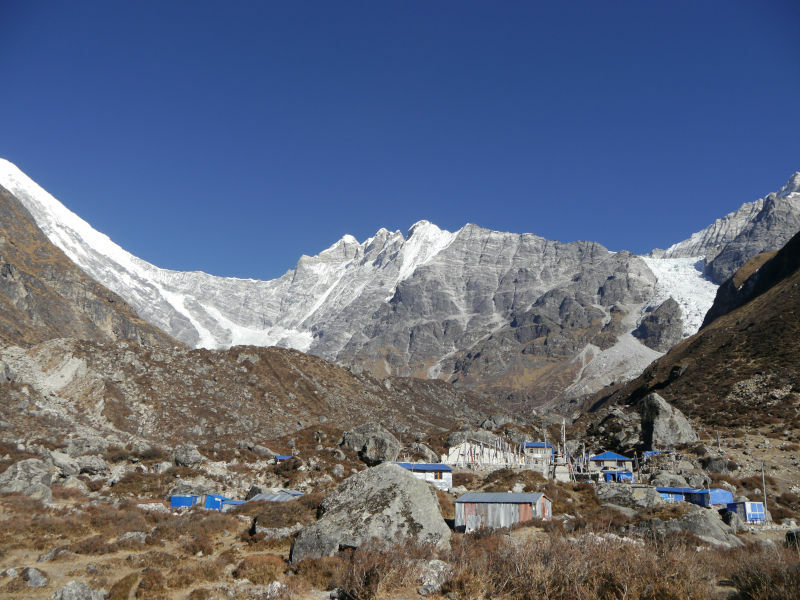 The town sits below Langtang Lirung and tomorrow’s summit – Kyanjin-Ri. The afternoon is yours to rest or explore this beautiful area. Today is the day we’ve been waiting for! After a steep two to three hour climb we reach the summit of lower Kyanjin-Ri! The 360° view is truly amazing and guaranteed to take your breath away! Spend time on the summit, taking photos and making memories that will last a lifetime! Or if you’ve got a head for heights, climb a little higher to the upper summit. We descend slowly and carefully in time for lunch and spend the afternoon resting in the sun or exploring the area. We return the same way, noticing the beauty in even more detail as we see it for the second time. Our gradual descent makes it easier walking, plus you’ll be filled with joy from all you’ve seen and achieved over the last few days! We continue our gradual descent, but this time taking a high road through the small settlement of Sherpagaon. The different views of the valley are well worth the extra climbing! After another long day, we reach Syabrubesi – it’s time to relax and celebrate! After such a fulfilling trek you’ll be glad to rest during the long drive back to Kathmandu, even if the bumpy road prevents you from relaxing completely! Once back in Kathmandu, check into your hotel and rest before we meet one last time for an end of trek celebration meal. 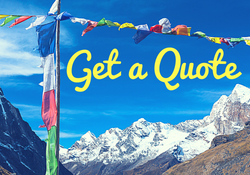 Prices for this trek start from just USD $519 per person! 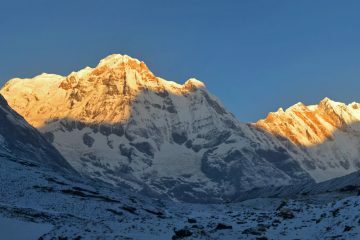 My boyfriend and I did the Langtang Valley trek with Nepalorama in early September ‘18 and it was fantastic! Everything was great – Anna was very responsive right from the start and answered all our questions which made organising the trip really smooth and easy. Krishna (our guide) and our porter were both incredible. 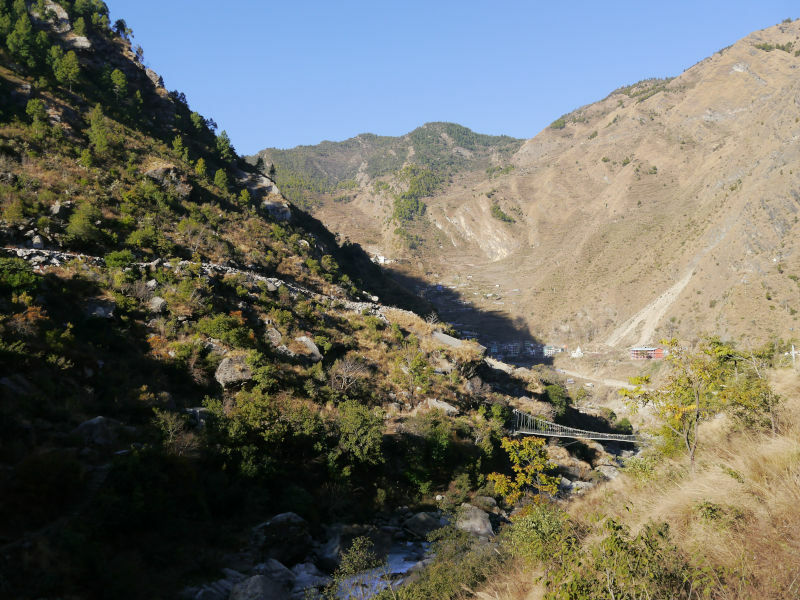 It was our first time trekking and so having someone to guide us and help us along the way, tell us about the area and history, and organise tea huts (with lots of tasty dal bhat along the way) was really useful. 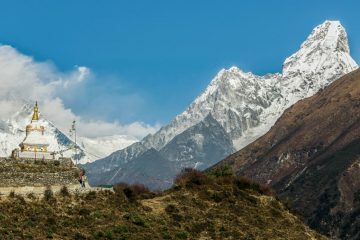 If/when we go back to Nepal for more trekking, we’d definitely use Nepalorama again and would thoroughly recommend them!